Please welcome: a king of card counters, Einstein of blackjack, a person because of whom all casinos tried to make the rules to win at blackjack more difficult, a mathematics professor and just a blackjack player - Edward O. Thorp. Sometimes Edward O. Thorp is wrongfully considered to be the inventor of card counting. But this is not exactly true. He continued and improved the work of Roger Baldwin. Thorp is famous by this book Beat the Dealer which was written in 1962. He took Baldwin’s strategies and added some techniques. Beat the Dealer became a national American bestseller and made casinos worry about their money. It was the first book about blackjack card counting systems which was available for everyone. All modern systems which we have now are more or less variations of the system represented by Edward Thorp. Casinos began to think over the methods of making a winning less accessible for players. It was the time when they started using special machines for shuffling cards. These innovations helped a bit of course. But when casinos tried to make some new rules of playing blackjack for Thorp’s book to become useless, people did not want to accept new rules and play according to them. 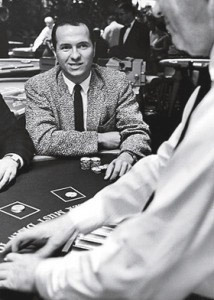 Casinos celebrated their small victory thanks to cards shuffling machines though it was obvious that everyone had a chance now to overplay a dealer thanks to Edward Thorp. Who is Edward Oakley Thorp? Edward O. Thorp is an American, born in Chicago. He is a mathematician by his profession who got his degree in California. Thorp worked as a professor of mathematics and finance. He is an author of a few books, such as our well-known Beat the Dealer, and also Beat the Market and The Mathematics of Gambling. When he wrote Beat the Dealer he used IBM 704 to help him to see if his strategies worked. He also went to Reno and Las Vegas to check if his system worked in practice. He won $11,000 in a weekend in Reno! And the casino security of Las Vegas noticed this inexplicable luck. The news about his luck was quickly spread and thus he understood that his strategy worked well. If so, he decided, it was the time to publish Beat the Dealer. What happened next – you know already.